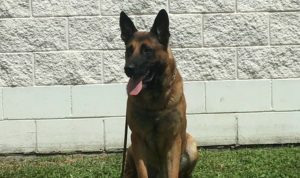 A series of questions remain unanswered Tuesday following the death of Charlotte County Sheriff’s Office K-9, Edo. Edo was found dead Monday, less than a half-mile from his handler’s home near the cross street of Velvet Lane and Cranberry Boulevard. Initial findings show Edo was hit by a vehicle. The sheriff’s office launched its own investigation into what happened to Edo, but their next steps depend on the outcome of the North Port Police Department investigation. They hope the investigation will answer some major questions: How did Edo get out of his kennel? Who was the driver that hit him? And why didn’t they call for help? “The whole thing may have been an accident. But we’d certainly like to know those answers,” City of North Port spokesman Josh Taylor said. Edo’s handler, Deputy Sean Davoli, is adamant that someone let the K-9 out of his kennel in the garage. But investigators say they found no evidence of anyone entering. 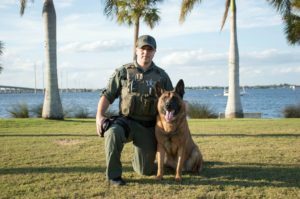 The driver who hit and killed Edo could face charges for the K-9’s death if the person demonstrated “gross recklessness” or “intent,” according to the North Port Police Department. Taylor offered some recommendations for drivers who don’t know how to react after hitting a dog without a collar on the road.